Erma Belle Flygstad was born on May 22, 1922 near Stratford, Iowa to William and Hazel (Hinman) Dutcher. She married Owen Kenneth Flygstad on August 8, 1954. He passed away November 13, 2004. Erma started out teaching in Country Schools and retired in 1984 from South Hamilton after teaching for 42 years. 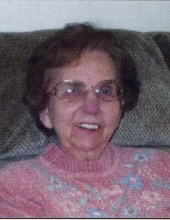 She was a member of Bethesda Lutheran Church and has lived in the Jewell area the past 60 plus years. Erma was a member of the Women’s Club and enjoyed cooking, but her family was the most important thing to her. Erma passed away January 21, 2019 at her home in Jewell at the age of 96. She is survived by two daughters, Lural and her husband Charles Lee of Nevada and Saundra Covarrubias-Troup and her husband Tom of Jewell; six grandchildren, Justin Lee, Kayla Lee, Ashlyn Lee, Jorge Covarrubias and his wife Alex, Jordon Troup and Cassie Troup and her sister, Fren Nelson of Marion, Iowa. She was preceded in death by her parents; her husband Owen and two brothers, Rollie and Gene Dutcher. In lieu of flowers, memorials may be made the South Hamilton Schools in Erma’s name. Private family services were held on Wednesday January 23 at Soderstrum-Reimers Funeral Home in Jewell. Burial followed in the Evergreen Cemetery in Jewell. To send flowers or a remembrance gift to the family of Erma Belle Flygstad, please visit our Tribute Store. "Email Address" would like to share the life celebration of Erma Belle Flygstad. Click on the "link" to go to share a favorite memory or leave a condolence message for the family.